When I Carried You in My Belly is a mother’s song to her growing daughter, capturing the warmth and magic of the time when her daughter was housed inside her belly. 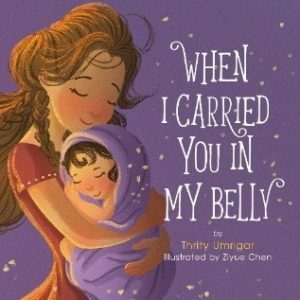 Thrity Umrigar’s lyrical and playful text are well complemented by Ziyue Chen’s soft and delightful illustrations, and together they create a sentimental and insightful book about the special bond between parents and children. With a similar tone to On the Night You Were Born and the spirit of I Loved You Before You Were Born, When I Carried You in My Belly is primed to become a new timeless classic.